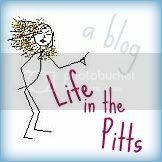 Life in the Pitts: He is such a lucky guy. I hate shaving my legs too and it always grosses my husband out! Glad to see I'm not the only one! You always make me crack up! I only recently began shaving on a regular basis. My poor husband. He never said a word though. PS Why is it that men aren't expected to shave thier legs too? ha, what a guy! That's when you know he's truly a keeper! That is hilarious! You definitely have a keeper! SO FUNNY!!! I never shave either!!! Oh dear... do you still have that long hair that you had named? Your blog cracks me up, glad to see I am not the only "natural woman" out there ~! Cute blog.. we just found it.. if you ever need new recipes hop on over! Seriously, I teared up. Some might say from giggling but I think it is because I found my soul mate.